NYIT Magazine is all about helping our more than 100,000 alumni stay connected to the university and one another. And that’s why we’re asking you to connect with us. Your stories are our stories. Share them. No news is too small (or too big!). Got a new job or promotion? Let us know. Volunteered or made a difference? You may inspire others to do the same. Went on a spectacular trip or had a life-affirming experience? Tell us about it—and send the pics. (include your name, mailing address, and your relationship with NYIT). Launched in 2002, NYIT Magazine is NYIT's official publication. Each issue features the latest news from NYIT's global campuses as well as student success stories, profiles of the university's top alumni and professors who are helping to shape our 21st-century society, and class notes. 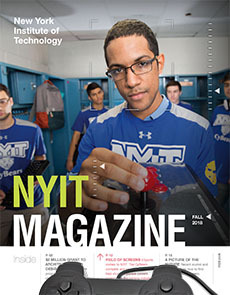 NYIT Magazine is published three times a year in print and online. It is distributed to more than 70,000 readers worldwide, including alumni, faculty, and leaders working in architecture, health care, engineering, computer science, education, business, communications, research, and more. 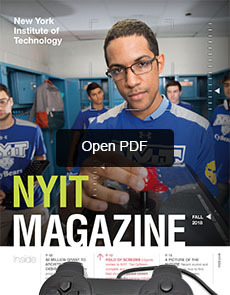 No portion of NYIT Magazine may be reproduced without written permission from NYIT.